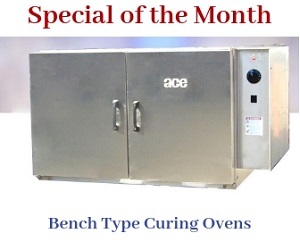 The ACE Burn Off oven model 3472-RT is a product with a hybrid design, providing customers the benefits of both convection and radiant tube heat cleaning. The oven’s design includes a radiant tube, automated One Touch Control system (OTC), and digital temperature control. The oven’s construction comprises 11 gauge steel, and insulation rated up to 2,300°F. These features ensure high fire load heating, complete elimination of hydrocarbons, ash, and combustible gases. Parts placed in the oven are removed completely bare and dry, ready for reuse. The construction ensures an oxygen deficient environment, allowing for quick and precise heat cleaning. The OTC monitors the process, ensuring the parts are cleaned thoroughly. It also ensures that all hazardous vapors and smoke are completely combusted. All combustible materials are destroyed, and the heating rate is automatically adjusted for exact processing. The oven also has primary and secondary water systems, which turn on to control the heat inside the oven. Armature Coil Equipment can design the oven according to NFPA, UL, FM, and ISO regulations. The technical specifications of this model are given in the tables below. Volume Over Cart 472 CU. FT.
2 Top Mounted Pressure Relief Hatch 27.00 Sq. Ft.
6 Gas Inlet Pipe Size 2"